Russian President Vladimir Putin speaks at meeting with cultural advisers in St. Petersburg, Russia, Dec. 15, 2018. Alarmed by the growing popularity of rap among Russian youth, Putin wants cultural leaders to devise a means of controlling popular music. 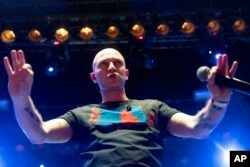 Rapper Oxxxymiron, whose real name is Miron Fyodorov, performs during a concert in support of rapper Husky, whose real name is Dmitry Kuznetsov, in Moscow, Nov. 26, 2018. Some of Russia's popular rap artists got together in Moscow for a charity show in a sign of solidarity for Husky who was sentenced to 12 days in jail for performing on a car. Husky's arrest, however, was hastily canceled and he was released.